Our trip to Kuala Lumpur began, as they do, with a night in My Place @ Surat hotel. 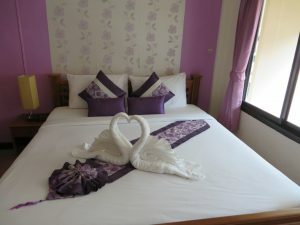 We love the swan towels, the central location, the air conditioning, and the king size beds. And all for AUD$20 per night! The next morning, it’s off to the airport for our regular flight to Kuala Lumpur. When we arrived, there was clearly preparation going on for a celebration of some kind. 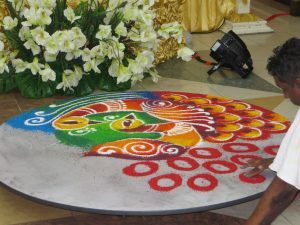 People were preparing designs from dyed rice, and lots of Malaysian flags were on display. Apparently, it was Malaysia’s National Day while we were in Kuala Lumpur. We had no idea … but its always nice to join a party. She’s only an employee, and probably a sadly underpaid one, but Mabel is worth her weight in gold to Amigo Hotel. We hope her employer recognises her worth. 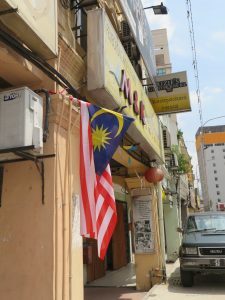 Our first port of call was Vinny Jaya, our favourite local nasi kandar restaurant. 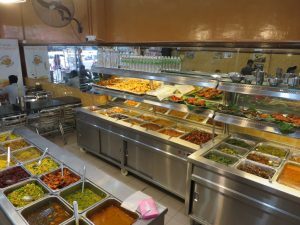 It is run by an Indian family and a vast number of employees, and is open from 6am until late. Best thing for us – a wide range of vegetarian options! And roti cannai. Also masala dosa. And teh halia (traditional Malaysian pulled tea with ginger). And, of course, Milo ais (iced Milo). Beside Vinny Jaya is the Lavana Hotel, where a particularly bright rice decoration was under construction. We stayed at the Lavana once, but the WiFi was simply not up to snuff. The lobby, however, is lovely. And especially so this time. It was also a red letter day on this trip, because the construction which had been happening at Pasar Seni was finally done! 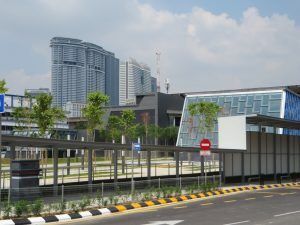 FOUR YEARS after our first visit to Chinatown, the new Pasar Seni MRT station was finally open for business. And with a lovely bit of green space out the front. No more scraping along the hoardings, trying not to get smooshed by the buses. Life was definitely looking up. We popped in to the Australian consulate general, picked up our new Australian passports (now six months matured already, due to the six-month tourist visa debacle in January), and got Thai tourist visas planted on their pristine new, empty pages. … fortunately, we have honest faces. And we were carrying the previous passports, with the entry stamps in them. Onward!